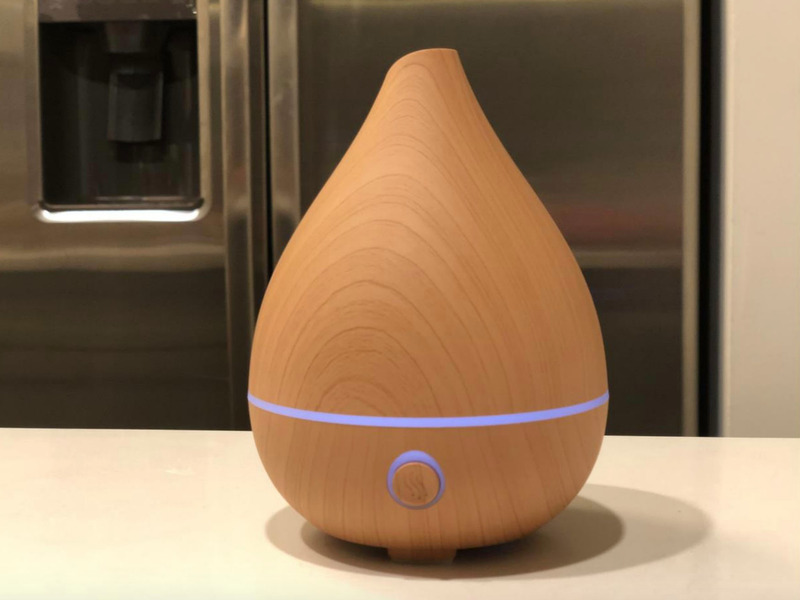 The VicTsing Mini Essential Oil Diffuser has a smooth and homey look with a wood-like finish in the shape of a teardrop. There is also an eight-color night light that illuminates from a sleek ring around the widest part of the diffuser and at the top where the mist is dispensed. The one negative I’d note about this product is that an essential oil starter kit was not included with the purchase — thankfully Amazon paired the product with a great six-set essential oils pack by Lagunamoon for only $12. Powered via an AC adapter, the diffuser holds 130 milliliters, which translates to three to five hours of pure bliss. All you have to do is twist the top off, fill the base with water up to the clearly denoted line, then place two to four drops of your essential oil in — I chose to use peppermint oil since I’ve read it clears your sinuses. The best part is that this diffuser automatically shuts off when the water runs out, so I wasn’t nervous to use it while I slept. This product was well worth the purchase and for someone like myself who has never used a diffuser or essential oils before — the ease of use was exactly what I was looking for. If you’re interested in aromatherapy and want to purchase an inexpensive, basic diffuser, I recommend trying out the VicTsing Mini Essential Oil Diffuser.